Full automation of heating & mixing solid/liquid combined food-stuff and paste form food-stuff all-in-one batch system renovated the concept of cooking kettle. An inclined scraping/mixing shaft together with a semi-spherical drum performs efficient agitation and mixing upward and downward, leftward and rightward. There is no pool for bacteria to stay, resulting in improved hygiene. The structure is designed to facilitate incorporation and mounting of sensors, high-tech equipment and other optional equipment, allowing creation of the delicate taste by automatic control. The area required for installation has been reduced by about 40%(comparison using a model with a full water capacity of 1,000L) compared to a conventional kneader, realizing space-savings. Blades suitable for products with medium and high viscosity and those different in specific gravity and auxiliary mixing elements of every type can be selected according to every purpose of use, such as breaking and dispersion of solids in powder, mixing and kneading of solids with liquid and products different in specific gravity. Various seasoned foodstuff, cooking sauce, curry & other gravies, sauses, soups, mayonnaise, dressing, miso, jam, flour paste and other paste & liquid form foodstuff. 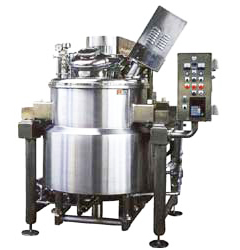 Also applocable to heating & mixing chemical products such as cosmetics industries and oil & fat industries.